Cebu was once a simple city but as the years passed, it has grown progressively that numerous skyscrapers, malls, buildings, condominiums, hotels, and a lot more are springing up like mushrooms. And speaking of hotels, if you're a Cebuano or Cebu-based, I'm pretty sure you know that a lot of newly-built hotels are emerging one after the other. This gives us, locals and tourists, more and more options for a place to stay here in Cebu. And for our December weekend staycation, we chose one of the new hotels in the metro, Maayo Hotel. Maayo Hotel is the first and only 4-star wellness hotel located along Plaridel Street, near the Marcelo Fernan Bridge. It's strategically situated 15-20 minutes away from the Mactan Cebu International Airport. It has an indoor therapeutic pool, rooftop infinity pool and bar, jogging trail, yoga space and several amenities that would complement every guest's health and wellness needs. Maayo Medical, the first ever DOH-endorsed medical tourism facility in the Visayas, which is located right beside Maayo Hotel, is also available for those who wish to have their health check-up. And like what they say, at Maayo Hotel, a truly unique and leisurely experience awaits you. Maayo Hotel's main lobby is located at the 7th floor. Upon coming in, we were welcomed with very friendly staff greeting us in Cebuano, "Maayong Hapon Ma'am/Sir", which I really appreciate. It was the first weekend of December when we went there so the lobby was decorated with Christmas ornaments already. And the giant tree is definitely one of the best accents displayed in the lobby. Anyway, it took us a while to check in our room because there were a lot of guests who came in ahead of us and were able to fall in line first. When it was our turn, I filled out some papers and then we were asked to wait for a while because our room was not cleaned up yet. Sheen got quite disappointed because it was already 2:30PM so it was supposed to have been cleaned up already considering that their check in time in 2PM. But I didn't mind as long as our room was cleaned up and prepared properly. Dayun is probably one of Maayo Hotel's famous spots that will definitely make you wanna go there. It's a lounge located at the main lobby in the 7th floor which welcomes the guests and visitors with a fresh ambiance and an overlooking view of Mandaue City, Lapu-Lapu City, and the iconic Marcelo Fernan bridge. Dayun lounge is actually one of my favorite spots at Maayo Hotel not only because it offers a breathtaking view but because they serve cakes, pastries, sandwiches, coffee and tea too! Uma is their all-day dining restaurant which is also located at the 7th floor. They offer comfort food that highlights Southeast Asian specialties. Aesthetically, Uma has a modern and contemporary ambiance which I really like. They don't offer buffet lunches and dinners yet but I have to say that their a la carte menu are worth the price because they serve really good food. Uma is also where the breakfast buffet is served and yes, their breakfast food are delicious! The room we booked at Maayo Hotel was their Superior Room which was offered at a promotional rate of Php 2,800 with free breakfast buffet for two (this promo was valid until December 31, 2017 only). So anyway, the Superior Room was spacious enough for the three of us. It had two twin beds, 40-inch flat screen TV, hot and cold shower, and most of the in-room amenities that you can find in a hotel. However, what sets Maayo Hotel apart is that their mini bar items are locally-produced. I posted it on my Instagram story that it was my first time to see an organic lemongrass tea as a mini bar item offered at a hotel. I love how Maayo Hotel really lets its guests experience and enjoy the Cebuano vibe. I love the room's turquoise colored accents too! 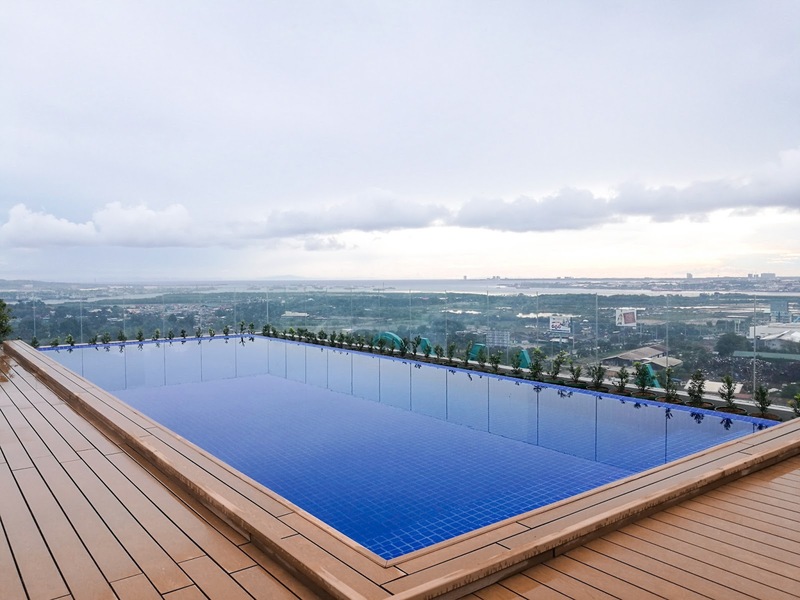 Another one of Maayo Hotel's famous spots is their infinity pool which also gives a breathtaking panoramic view of the city. The infinity pool is located at the 16th floor. We took a swim around 4:30PM to catch the sunset and indeed it was a beautiful view especially when the colors of the sunset reflected in the pool. The next morning, we woke up early to have breakfast, get changed into swimming attire, and make sure that we get to the pool first so we can take "people-less" photos of the pool. Haha. I love the relaxing vibe that you can feel when lounging by the pool area. Lying on the sun beds, watching the calm pool waters, and enjoying the view of the city. Ahhh what a beautiful life! Haha. Can you guess that I was imagining myself doing it while typing this? Lol. Hehe thanks te! Nindot bitaw gyud te! Ganahan kaau mi mubalik didto puhon! Nice review, I was actually looking at this new hotel last year but I can't find many reviews back then. Then is very helpful, thank you girl for sharing! Ang ganda ng hotel for P2800 ah!! And the lobby!! It caught my eye talaga.